Tag Archive | "Microworms (Panagrellus redivivus)"
Microworms (Panagrellus redivivus) are actually small, round, free living nematodes, that are easy to grow, easy to collect and make a great food for tiny tropical fish and baby fry. Traditionally, newly hatched brine shrimp nauplii have been used almost exclusively by tropical fish keeping enthusiasts as the initial food for fry however, they die within a few hours in freshwater, and the fry of many fish species find them too large to be ingested. The most significant drawback to their use is the increasing cost of brine shrimp eggs . Many tropical fish keeping enthusiasts now feed microworms as an initial diet to their fry, and as a complement to baby brine shrimp. Of the thirteen currently recognized species of Panagrellus, many are widely used in aquaculture as a live food for a variety of crustaceans and fish species. Panagrellus redivivus are approximately 1/16″ long and 50 microns in diameter. They have a round mouth, a pointed tail, and are barely visible to the naked eye. Because of their small size and shape, and the fact that they can live in fresh water for 12 hours or more, they are a prime live food source for fish that are too small to eat brine shrimp nauplii..
Panagrellus redivivus are sexually mature in about 3 days and unlike most other nematodes that lay eggs, Panagrellus redivivus produce live offspring. 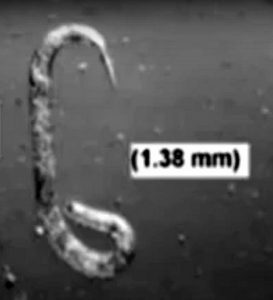 Female Microworms deliver 10 to 40 young every 1 to 1 1/2 days during their 20 to 25 day lifespan. This means that an individual female will produce approximately 300 offspring during it’s lifetime. The young grow quickly and triple in size the first day. During the next three days, they will increase in size 5 to 6 times. Microworms are easily cultured on a substrate of flour paste, baby cereal, porridge, rolled oats, or the like, with just enough warm water to form a thick paste. The mixture should have a pasty consistency thick enough to be rolled into a ball. Evenly spread a 1/2″ to 3/4″ thick layer of a rolled oat and yeast mixture into a flat, shallow, (2″ or 3″ high) covered, plastic food container, with a tablespoon or more of baker’s yeast evenly mixed in. Make sure the lid on the container has several 1/8 ” holes drilled into it for air. Sprinkle the Microworm starter culture evenly over the mixture and leave it in a warm, well lit location for a week or so. In order to produce the greatest amount of microworms, the culture should be maintained at a room temperature of 68-85°F. As the growing medium is broken down by the microworms , they will start to crawl up the sides of the plastic container where they can be easily harvested as needed. 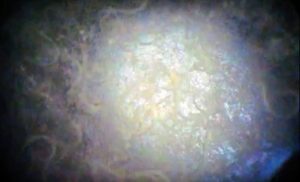 Usually it only takes about 3 to 6 days before the surface of the growing medium is populated with a shimmering mass of microworms to feed your fish. To optimize the production of microworms, simply stir the culture weekly. As the rolled oats are used up by the yeast and the microworms, the mixture will become thin and soupy. Although this does not diminish the amount of microworms that are produced, you can easily absorb the excess moisture that has accumulated by placing a small piece of sponge on top of the media. In about a month, as the growing medium becomes exhausted and starts to turn brown, microworm production will slow down and eventually cease. When this occurs, it’s time to dispose of the original culture and start a new batch. To harvest Panagrellus redivivus, simply scrape a batch off the wall and top of the container with a butter knife or a rubber spatula, or put a paint stick on the media for the worms to crawl onto and then scrape them off. Typically an 8″ x 12″ culture of rolled oats will produce approximately 1 to 1-1/2 teaspoons of Microworms a day for three weeks or more. Rolled oats are used in the above recipe because they are inexpensive and much more economical for the large scale production of microworms. Instant Ralston cereal , brewers yeast, baker’s yeast, and beer. The cornmeal mixture normally produces fewer Microworms than rolled oats and the other mixtures however, when it comes to mass production, they are all more expensive than the rolled oats used for livestock feed. Most tropical fish keeping enthusiasts who are not into commercial breeding can produce plenty of microworms using any of the above recipes. Microworm (Panagrellus redivivus) starter cultures are available from a variety of sources online at reasonable costs. Like any other live food, vary the diet of your tropical fish to keep them in prime condition.